Extend Ethernet beyond 100 meters over copper wires or coaxial cable. With features, such as wide temperature, DC power inputs, panel or DIN mounting options, these devices can be applied to a variety of harsh and light duty applications. Some models offer Power over Ethernet (POE) and Power over VDSL (PoVDSL) so end devices, such as IP Cameras, Access Points or IP Phones, can be remotely powered. Enjoy distances up to 1,200 meters over copper wire and distances as great as 2,000 meters over coaxial cable. Ideal applications include parking systems, video surveillance, tank monitoring and connecting power sub meters. 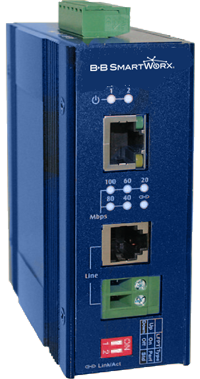 The EKI Series of Ethernet extenders offer hardened reliability, innovative power and flexibility. With EKI, upgrading and implementing Ethernet networks with extended distance and upgraded power capability is no longer a labor intensive, time-consuming and expensive project. Elinx EIS and EIR Extenders extend Ethernet connections up to 8,530 ft. (2,600 m) via coaxial cable or up to 6,200 ft. (1,900 m) over a pair of unused straight copper wire. 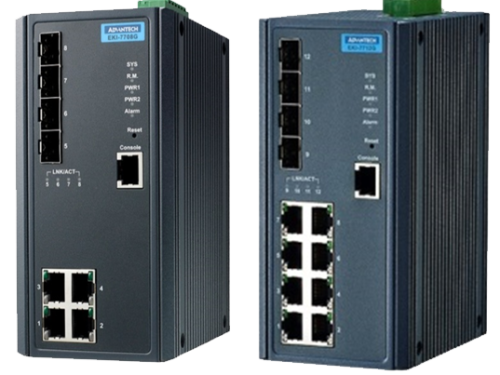 Compare our Ethernet extenders below to see which model accommodates your application needs. Simply fill out the form below, and someone from the B+B SmartWorx team will be happy to contact you!.